Recently, I’ve been complaining about how they are so few comic book adaptations of Hodgson stories. Imagine my surprise when good pal Joey Zone pointed me to this little gem! It’s an odd little thing. 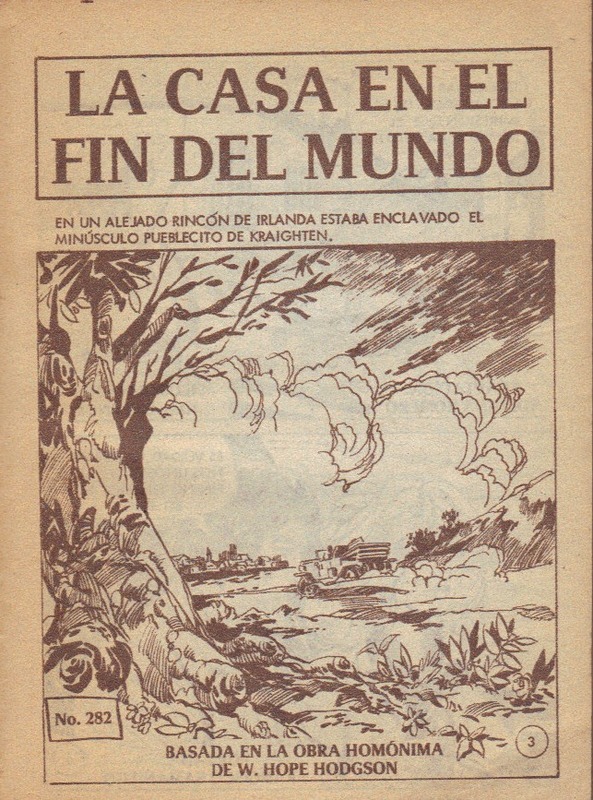 This is a graphic novel adaptation of Hodgson’s THE HOUSE ON THE BORDERLAND but published in Spanish. It’s small, only 4 3/8ths by 5 7/8ths and the interior pages are b/w. Near as I can tell, it was published in April, 1983, but I’m not sure who the publisher is. 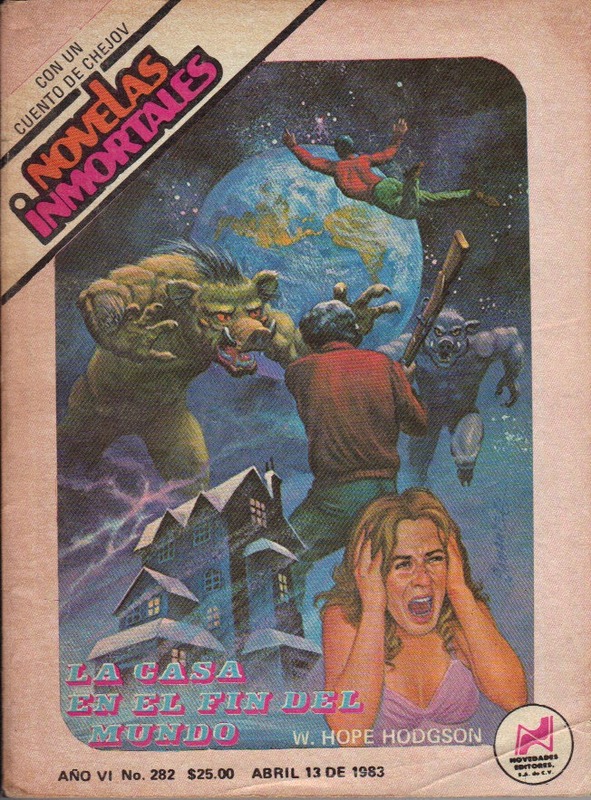 This is apparently # 282 in the series “Novelas Immortales” which I think means “Immortal Novels”? Sadly, I do not know Spanish so cannot read this or say for certain who wrote or drew this adaptation. It clocks in at 200 pages and, as the samples I have below show, was drawn in a style very similar to Marvel Comics of the 1980s. From what I can tell, the author takes some liberties with the novel with a different ending and making the two main characters a couple rather than brother and sister. At least I hope they’re a couple based on some of the panels! If anyone can provide some translations, I’d be very grateful. If the date of 1983 is correct, that makes this the FIRST comic adaptation of Hodgson’s work predating DC Comic’s graphic novel which did not appear until 2000. But the adaptation of Hodgson’s novel aren’t the only there here as there is also a 20 page story called “El Tragico” which I believe to be an adaptation of Anton Chekhov’s “A Tragic Actor”. Here are some pages from the book. I know nothing of the creators, but it catches the story’s spirit pretty much perfectly. I´ve read some issues of Novelas Inmortales during my childhood, but never have been reading this one, i´ll look for it, thanks. 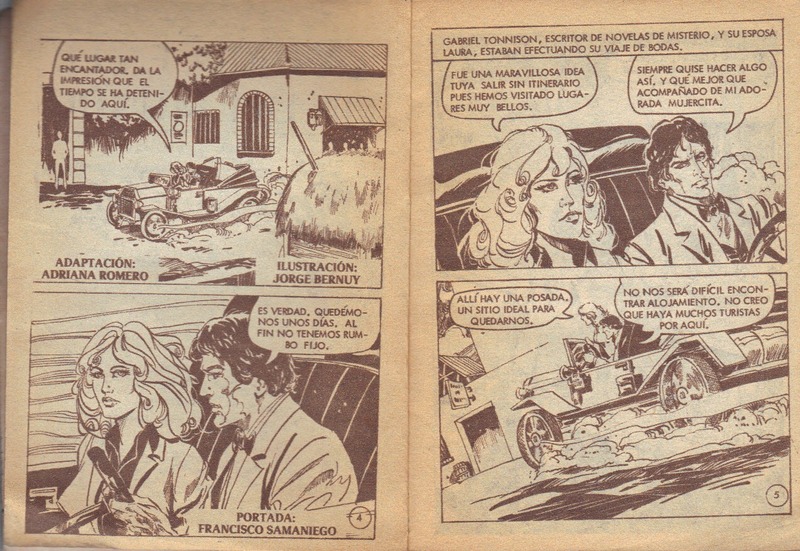 Not much, he was a recognized illustrator and painter in Perú, later he moved to Mexico, and produced a lot of material, this comic for example. He died in year 2000.
has some basic info on Bernuy. the artist (jorge bernuy) was peruvian, the others i don´t know. honestly, based on the few pages you show, doesn´t seem to be the best of this book´s adaptations. the guy and the lady in the first pages are Tonnison and his “wife”, entering the town of kraighten in a kind of vacation travel. 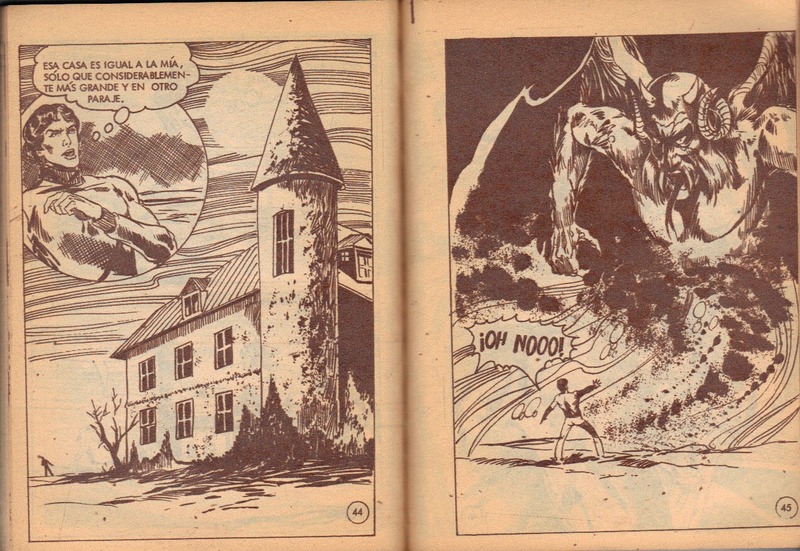 the third image shows the ghostly replica of the house as seen in the recluse´s astral travelling and the giant monster that lurks in there. truly rare to find adaptation. With 200 pages, I couldn’t scan a whole lot of them but tried to use the ones that were closest to the original novel. Still, it is a lot different. Is there any information on Jorge Bernuy? 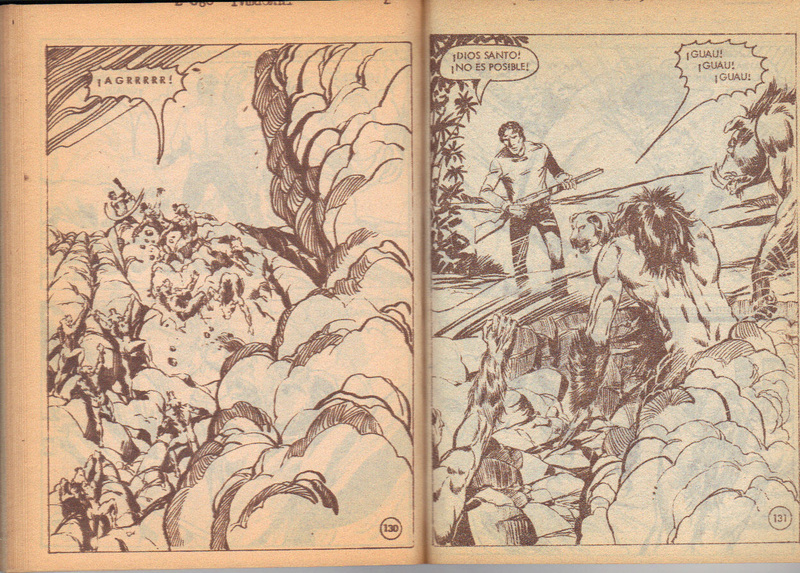 From what I could find, Bernuy was a student of Ricardo Villamonte, who drew for Marvel & DC in the 70s and 80s. Bernuy did a sci-fi weekly comic called “Novac” for the newspaper La Prensa (Peru, I assume) in 1973, something called ‘Yahuar el Guerrero’ (Yahuar the Warrior) for a supplement of another periodical called Equis X, and then moved to Mexico in 1980, where he drew a comic adaptation of Tarzan and was the regular illustrator for the “Novelas Inmortales” series. My spanish is only so-so, so someone more fluent might want to check my facts, but I think I’ve got it right. Thanks for the info! Looks like my thought of a Marvel influence wasn’t far off the mark.